Is It Necessary to Do Exploration of the Right Side During Tep Repair for the Left Inguinal Hernia? INTRODUCTION: Laparoscopic herniorrhaphy (LH) LH has ability to examine an asymptomatic contralateral side and repair occult contralateral hernia coincidentally with less morbidity. 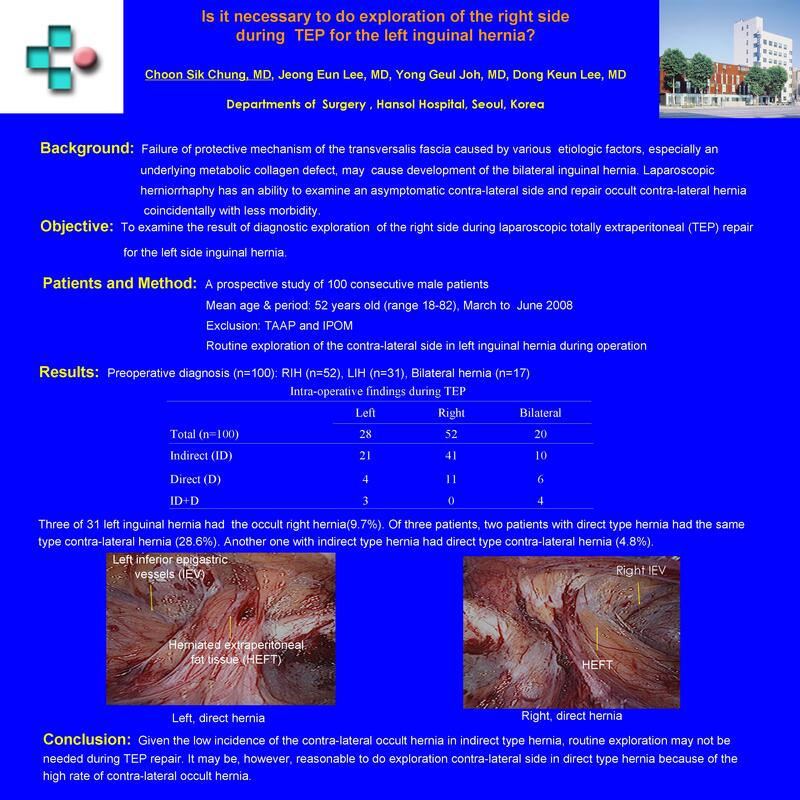 In this prospective study, we aimed to examine the result of diagnostic exploration of the right side during laparoscopic totally extraperitoneal (TEP) repair for the left side inguinal hernia. METHODS: A prospective study of 100 consecutive male patients who performed TEP repair by a single surgeon (C.S) between January and May 2008 was conducted. Two transabdominal preperitoneal prosthetic (TAPP) repair and one intraperitoneal onlay mesh (IPOM) cases were excluded. We routinely explored contralateral side in patients with the left side hernia on physical examination to reveal the incidence of the right side occult hernia. RESULTS: Mean age was 52 years old (range 18-82). Among the 100 patients, 17 had bilateral hernia, 52 right hernia and 31 left hernia on physical examination prior to surgery. In 31 left hernia of them, three was revealed to have contralateral occult hernia (9.7%). Of three patients, two patients with direct type hernia had the same type contralateral hernia (28.6%). Another one with indirect type hernia had direct type contralateral hernia (4.8%). CONCLUSION: Given the low incidence of the contralateral occult hernia in indirect type hernia, routine exploration may not be needed during TEP repair. It may be, however, reasonable to do exploration contralateral side in direct type hernia because of the high rate of contralateral occult hernia.